An industrial enclosure's job is to provide protection to the expensive equipment within it. Interestingly, one of the easiest and most efficient ways to keep theives and vandals away is to make the industrial enclosure less visible. Simply avoiding attention prevents most issues. Proper size, custom color and a plain exterior are important design features which provide passive protection against vandalism and theft. Of course a robust structure and locking doors provide active protection against such threats as well. Let's take a look at what can happen to unprotected equipment. Everything went smoothly during construction at your new manufacturing warehouse and you were even able to cut down some costs by installing your backflow preventers above ground instead of in a vault. You decided against a box because in sunny Arizona, you don't really have much need for freeze protection. It's been a few days since you started production and you are relaxing at home getting ready for another day managing everything. It's 9 p.m. and, unbeknownst to you, a pair of thieves are walking up to your backflow preventers with metal saws ready to steal the valuable copper and brass. When you come in tomorrow, you'll find that production cannot continue until your device is replaced. 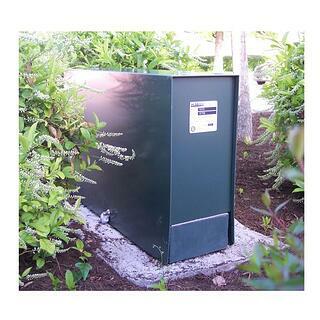 When your valuable equipment is safeguarded with an enclosure, you have peace of mind. A correctly sized and designed cover can prevent the thief from knowing there is valuable metal within in the first place. Also, Safe-T-Cover aluminum hot boxes are sturdy with lockable access panels to prevent a theft even if the thief knows what's inside. The newest high school in El Paso, Texas was completed over the summer and now school has been in session for about a month. It's mid-September and the district office is much less concerned with working out all the kinks of that particular building. The backflow preventers were placed above ground outside behind the school in an area off limits to students. Unfortunately, making an area unavailable to teenagers often increases their interest in it. One day a bored teen decides to start turning the shutoff valves and opening the bypass valves, trying to get water to flow through the relief port. Once again, an enclosure would have prevented this as the curious person would not have access. Not knowing what's inside also provides protection as it can keep someone from vandalizing the equipment. Safe-T-Cover offers custom sizes and four standard colors at the base price to help make the cover blend in. This means it won't be as interesting as a piece of equipment. Download a free guide for more information on backflow covers. Much like most other days, you're expecting a delivery today at your business. This used to make you nervous when you were first starting out because some of the expensive equipment you need to operate is located a little too close to the bay for comfort. Over the years, you've begun to trust the drivers that are now considered friends. 1:15 p.m. rolls around and you begin to wonder where George is, because he's so rarely behind schedule. Finally, after another 45 minutes of waiting, the truck rolls into view and you head to the bay to greet him. It's not George you see with his hands in his hair staring at your equipment crushed under the truck. While theft and vandalism may be more prominent worries, accidents can be just as, if not more, costly and time consuming. Delivery trucks, service vehicles, tow motors, and passenger vehicles are often the culprits of backing into expensive equipment. An enclosure is a bit easier to see than an air valve or back flow preventer, making it less likely to be hit in the first place. 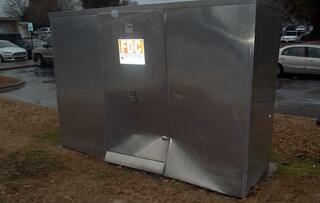 However, if the worst does happen, in most cases the aluminum box is damaged but keeps the equipment inside from harm. Safe-T-Cover uses an interlocking panel design and replacement panels are available in case of this type of accident. A locked box can also prevent curious hands that want to touch things they know nothing about. Employees, customers, passersby could walk up and touch something they shouldn't if there is no protective enclosure. All of these scenarios could easily have been prevented had a protective industrial enclosure been installed around the equipment. It's easy to find exactly what you need from Safe-T-Cover. Call us at 800-245-6333 with questions or for help designing your custom cover.